Over the Christmas break, I wrote about my long-standing interest in electrochemistry. Indeed, many interesting things are possible on electrode surfaces. But let’s not forget that there are some aspects of electrosynthesis that are exceptionally challenging. The biggest one of all lies in the difficulty to control the fate of electrogenerated intermediates. For instance, you can create some really neat radical cations using anoxic oxidation, yet their diffusible nature renders them tough to control. Unless one of the reagents is used in large excess or the reaction is intramolecular, alternate pathways can take over the reaction landscape. It’s no wonder that metal catalysis continues to be the go-to source for achieving selective transformations in chemistry: bond-forming events tend to take place within the metal coordination sphere, which helps achieve control over reactive intermediates. Now let’s consider photochemistry. Photochemical transformations have a lot in common with electrochemistry in that it is often difficult to control the pathways accessible to photoexcited states. Yet, there are marvelous examples that enable rapid increase in molecular complexity despite the low isolated yields. Witkop reaction is one such process. This transformation has been expertly reviewed by Gaich and co-workers in Angewandte Chemie (http://onlinelibrary.wiley.com/doi/10.1002/anie.201307391/abstract). 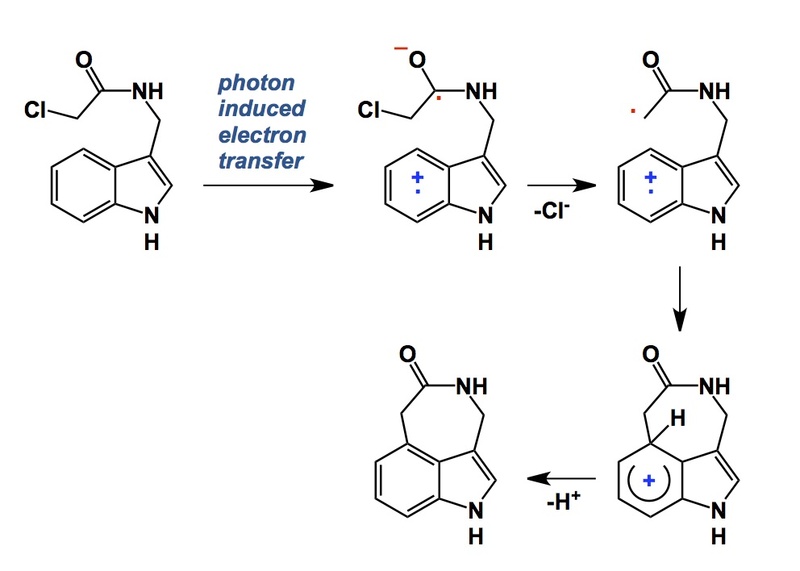 The Witkop reaction is believed to proceed through intramolecular photon-induced electron transfer from the excited state of the indole chromophore to the chlorocarbonyl group. Subsequent loss of the chloride anion leads to a diradical cation, which ultimately gives the substitution product shown below. As the authors point out, average yields range from 30 to 55% (with by-products rarely reported, which is too bad…). However, the utility of this reaction in complex molecule synthesis proves its value relative to cumbersome alternatives to achieve the same objective.